sam bot dot com :: "Kurt is up in heaven now." 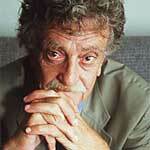 Kurt Vonnegut died yesterday. He was 84. This makes me so sad. "I am, incidentally, Honorary President of the American Humanist Association, having succeeded the late, great science fiction writer Isaac Asimov in that totally functionless capacity. We had a memorial service for Isaac a few years back, and I spoke and said at one point, 'Isaac is up in heaven now.' It was the funniest thing I could have said to an audience of humanists. I rolled them in the aisles. It was several minutes before order could be restored. And if I should ever die, God forbid, I hope you will say, 'Kurt is up in heaven now.' That's my favorite joke." Anyway, R.I.P. Kurt Vonnegut. And if you haven't already, you should read Vonnegut's The Sirens of Titan, followed by Slapstick... two of my favorites.